A sheet pan meal is just perfect for a day when you don't have a lot of time to prepare a large family meal. This flavorful sheet pan meal is ready all at the same time and you don't even have to find a platter to serve it on, just garnish and serve. 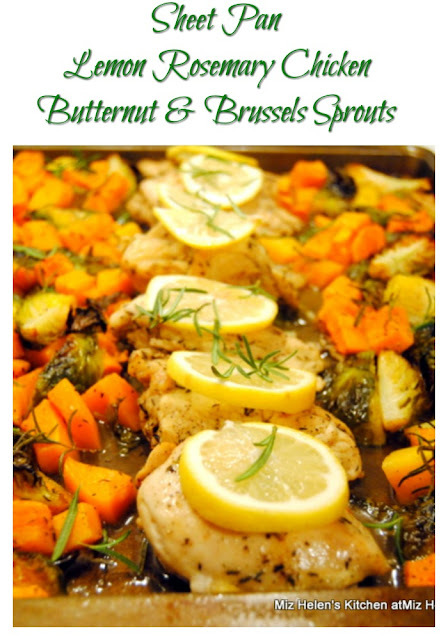 I love the flavor combination of lemon and rosemary and the butternut squash with the Brussels Sprouts are perfect to share this sheet pan. In a large zip lock bag place the chicken breast with the lemon juice, 1 teaspoon salt, 1 teaspoon pepper,1 teaspoon garlic salt, 1 sprig fresh rosemary. Make sure all the chicken is fully covered with juice and seasons, then refrigerate for 30 to 45 minutes or while you are preparing the vegetables. Peel the butternut and cut in cubes, place in a large mixing bowl. Quarter the Brussels Sprouts and place in the mixing bowl with the butternut. Place into the mixing bowl the olive oil and the melted butter along with 1 teaspoon salt, 1 teaspoon pepper, the crushed leaves from 1 sprig of rosemary, and 2 teaspoon thyme. Toss the vegetables in the season mixture until completely covered. Remove the chicken from the marinate and lay down the center of a baking sheet pan. Place the seasoned vegetable mixture on either side of the chicken, then pour the remainder of the vegetable season on top of the chicken and vegetables. Place the sheet pan in a 425 degree oven 25 to 30 minutes, until the chicken done through. Remove the pan from the oven and place a slice of lemon on each chicken breast. Garnish with fresh rosemary sprigs. Thanks so much for stopping by to enjoy this delicious Sheet Pan Lemon Rosemary Chicken With Butternut and Brussels Sprouts. There is always one more place at our table for friends and family, food is just better when we share it! Hope you have a fantastic week and come back to see us real soon! Wow! This looks like it is delicious AND healthy. Thanks for sharing your recipe with us. I saw your post over at The Dedicated House blog party. Sheet pan dinners are wonderful for busy days! I love this recipe, Miz Helen. It's got so many great flavours and such a lot of healthy ingredients. Thank you for sharing, and for being a part of the Hearth and Soul Link Party. I hope you are having a lovely week! wow!! What a deliciously beautiful dish! Thanks for sharing at the What's for Dinner party. Can't wait to see what you'll bring this week! I love a good sheep pan meal and you have so many of my favorite flavors here. YUM!